Create 1099 form in Five Minutes or Less! How to Fill Out 1099 misc 2017? What Is A 2017 1099 Misc? 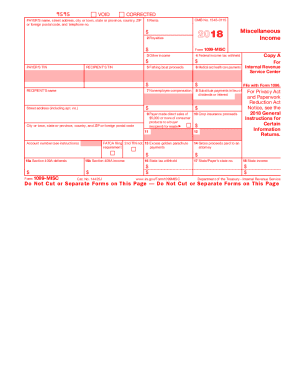 The 1099 MISC form is indented for your use in case you are an independent contractor or a freelancer. It is necessary to report income, other than wages salaries and tips to the IRS. Rental property income, earnings from interest and dividends, sales proceeds and other miscellaneous revenue may be included. This document may also apply to your situation if you make more than $600 working as a contractor. In case, you work for more than one client, it is obligatory for you to complete a 1099 MISC form for each client you’ve performed services for. It is convenient to submit the paper electronically in PDF format. You may use fillable templates that are available online. Just insert the required information into the fillable fields. Customize and edit according to your needs. Here is the brief guide of how to prepare the 1099 MISC form correctly. Follow the instructions below to avoid any possible mistakes. Insert your personal data: name, address, contact number(s) and ZIP code. Indicate the social security numbers of both payer and recipient. Specify rents, royalties or other income. Pay attention to the figures you provide to avoid any misunderstanding. Sign the file. You can add your signature by typing, drawing or uploading it. Forward the document to the addressee. Note that you must submit the completed document to the IRS by January 31st of the tax-filing year. With the tax period coming both the individuals and businesses have to report their financial details to the IRS. Such information is used for calculating and withholding the correct amount of federal tax from their income. Here various IRS forms such as Form 1099, Form 886-H-DEP, W-9 2017 and Form 3911 may come in handy. You can easily complete any template in PDF just following our instructions. Fill out, sign and file editable samples online with no effort.